My mother started the tradition of these precious stacked Christmas cookies. They are little divas, very delicate, you have to be gentle with them as they are a bit fragile but they are worth all the effort – trust me! Apart from the fact that they look simply stunning, the buttery short crust of these cookies is one of the best I ever had. Just perfect, buttery but still light, flaky – they will melt in your mouth. The dough isn’t much work at all. It needs to sit for half an hour and then you can start cutting out your cookies, baking and assembling them, with redcurrant jam or jelly in between. Some sugar dusting on top and they are done. You should just handle them with care and appreciate that you have something very precious and delicate between your fingers. 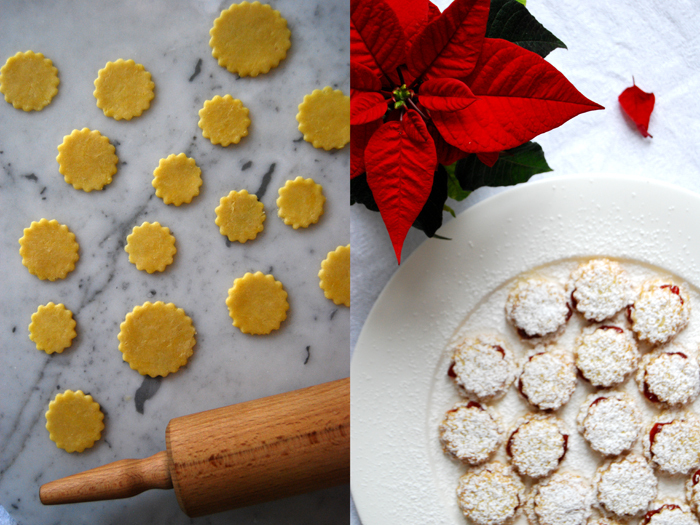 You need round cookie cutters in 2 or 3 different sizes (mine are 3.5cm / 1 1/2″ and 4.5cm / 1 3/4″). Combine the flour with the sugar and salt. Cut the butter with a knife into the flour until there are just little pieces of butter left. Continue with your fingers and quickly work the butter into the flour until combined. Add the egg yolks and the water, continue mixing with the hook of your mixer until you have a crumbly mixture. Form a disc, wrap in cling film and put in the freezer for 30 minutes. Preheat the oven to 175°C / 350°F and prepare a baking sheet with parchment paper. Roll the dough out thinly (about 2-3mm) between cling film and cut out your cookies with a floured cookie cutter. If you want to have 2 different sizes cut out an equal amount of cookies with each cookie cutter. Place your cookies on a baking sheet and bake them for 8 minutes or until golden but not dark. Let them cool for a minute or two. 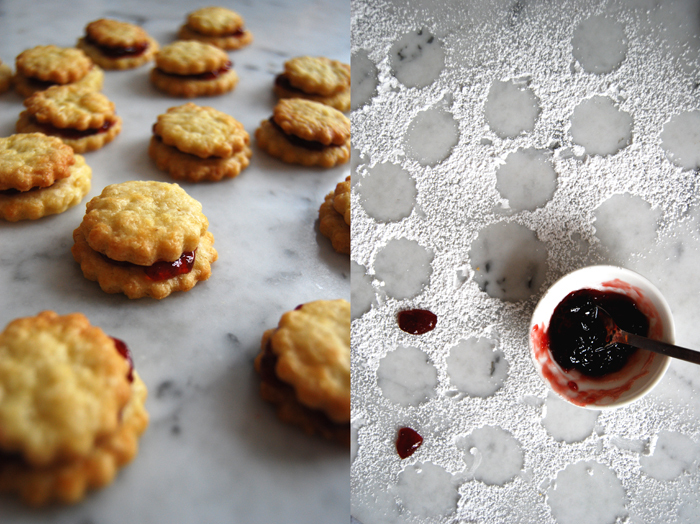 Place 1/4 teaspoon of jam on a bigger cookie and put a smaller one on top. Press a little bit but not too much as they might break. 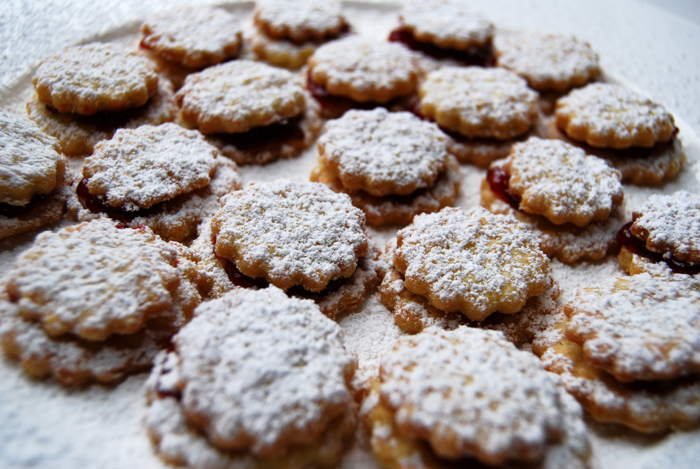 Let them cool completely and dust with icing sugar. Enjoy their beauty and – when you’re ready – pile them up carefully in a cookie box.